An underfloor heating kit for new-build extensions and conservatories. A Screed OneZone® kit includes the same standard of high quality components that are found in a Nu-Heat fully designed system. It can be installed on top of insulation in an extension or conservatory before the screed is laid. It is very simple to install and offers a good, efficient heat transfer in a simple and cost-effective package. A choice of market-leading thermostat – either the hard-wired neoStat or the wireless neoAir – is also included. The underfloor heating tube is simply clipped into the insulation layer before the screed – whether trowel applied or liquid pumped – is poured. The chosen floor covering can be laid on top of the screed once dry. 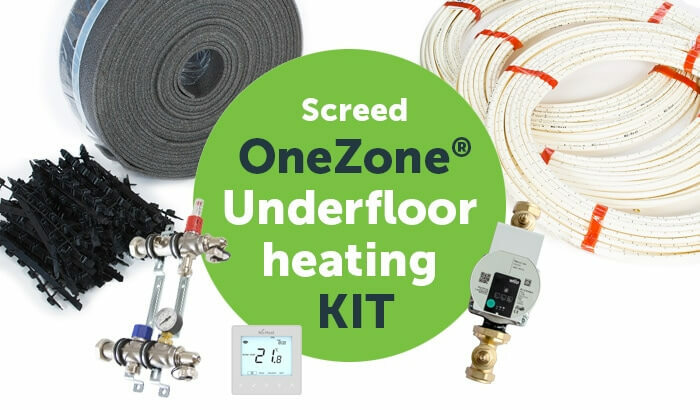 You can order a Screed OneZone® kit online, through the Nu-Heat Webstore. Simply select the room size and thermostat option from the drop down menus below to be directed to the online shop. A popular option for renovation projects, the wireless neoAir avoids the need for chasing any wires into walls, protecting décor. Like the hard-wired neoStat, it can be easily upgraded to offer smart control functionality by adding the neoHub (please call us on 01404 549770 to upgrade). The neoAir system includes an RF switch, enabling wireless control of the boiler and pump, avoiding the need to run cabling from the wiring centre back to the boiler.